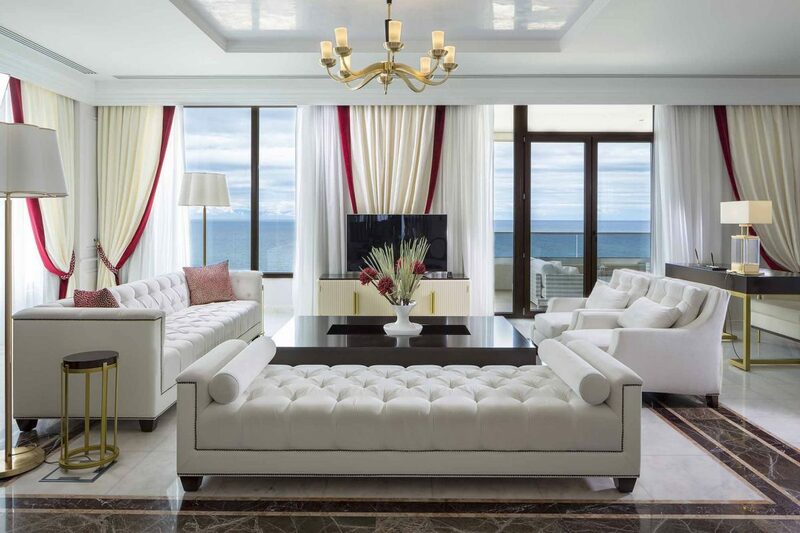 This amazing brand-name suite occupies a prime position in the resort, with stunning views over the Aegean Sea. Beautifully designed and with a unique ambient, this accommodation is ideal for couples. The layout of this suite includes one king size bedroom (featuring a hand-woven leather headboard), an extra-large living room area (including a full size desk and dining area) and a luxury marble bathroom, with separate Jacuzzi and walk-in shower. All Prestige Suites enjoy “upscale” amenities & cosmetics by Chopard & Hermès. For further accommodation please check the Presidential Suite.